Just a year after the first Mi Max, new leaks revealed that Xiaomi has a successor coming up that they are expected to unveil in May 2017. In addition, they provided a few clues about the hardware in the phablet. This year is shaping up to be the year of the bezel-less display, but it’s not Samsung’s Galaxy S8 or the LG G6 that’s pushing the boundaries of this new trend with phablets like the Xiaomi Mi Mix. Xiaomi is also following up on the popularity of large screens with a successor to the Mi Max aptly called the Mi Max 2. This phablet, while not so bezel-less as the Mi Mix, may feature a 6.44-inch panel, up to 6GB of RAM, 128GB internal storage and a 5000mAh battery, sources say. This battery is generous to say the least, just as it was in the previous Mi Max, which outclassed its competitors from Samsung and Lenovo in battery longevity by a significant margin. 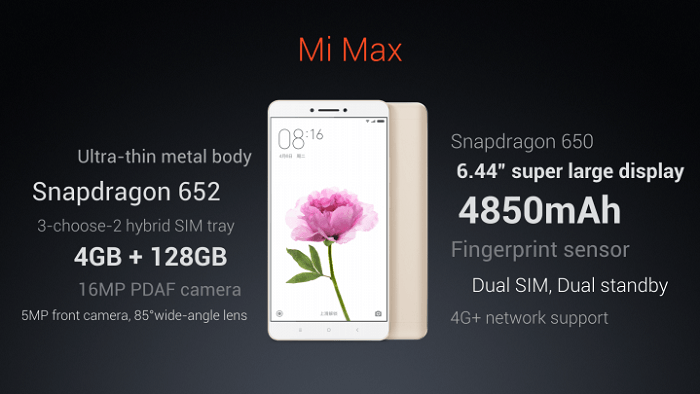 Externally, the Mi Max 2 is expected to see minimal changes. Most users felt that the device was well-designed, especially considering the lower price of the phone which cost around $230 for consumers based around India and China. As always, a lot of the difficulty with Xiaomi phones is that historically, the company has focused solely on Asia, making the phone inaccessible to users elsewhere unless they are willing to go through 3rd-party resellers. Xiaomi, facing a competitive domestic smartphone market in China, has indicated that they may be diverting more attention towards the West in the future. The leaks did not reveal a potential launch date.